We know our birth stone usually, do you know yOur birth month flower? Who0ow.. I never knew about my birth flower.. I was born in July. What's a Larkspur?..lol.. I don't think I've really seen one. Or probably I've seen one, only that I didn't know what it was.. Thanks for this post though. Now I know what birth flower I have. The Larkspurs! Yippee... =D lol..
Hi d00d00, here's the close look of the Larkspur. That was nice of you.My birthday is July 10th,my flower is Larkspur.But my favorite flower is a rose which is for June.Maybe I was born a moth too late,but I was already real early I was supposed to be born on September 17th.So,I probably would not be alive if I was born in June,lol. Larkspur is a rare flower... and I like the violet color. That's great! I am glad that you like it. Yeah! when I was a young girl my mother bought me a diary as a Christmas gift, within its pages were such interesting things listed such as what each year of marriage is represented by be it paper, linen, cotton, silver, gold etc. there were also listing of birth stones, birth gems and birth month flowers. although the one they listed for me was different than the one that you have found. interesting anyhow, huh? Very interesting, and those genius that gather all this information are awesome. I did not know that my birth month flower is Daisy till I read about your informative discussion. "The month of April is represented by the daisy. Daisies have long been associated with innocence. 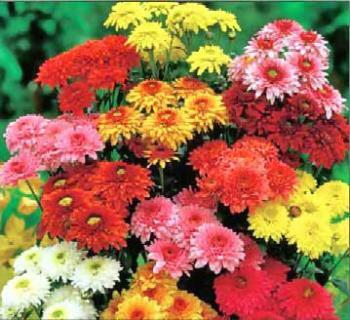 The large vibrant blooms of the gerbera daisy have made it a favorite among flower lovers." Now I see why daisy is one of my favorite flowers. Thanks for the discussion. Take care.